Do You Struggle with Drinking and Lack of Motivation? This is the journey of Greg Galmin: PhD student, Future Physician, and Assistant Coach. 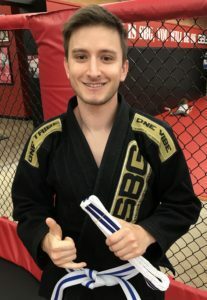 Before joining SBG Athens, Greg struggled with binge drinking, lack of motivation, and an unsure future. A former martial artist from his youth, Greg was afraid of getting taken down and not knowing what to do. He knew he couldn’t solely rely on his stand-up, Karate knowledge. Additionally, he needed a physical outlet for his struggles, and lifting weights wasn’t cutting it. Probably the largest driving force for reaching out to SBG was his alcoholism. He knew he had a void in his life and if he didn’t fill it with something, he would drink himself to death. After only two weeks at SBG Athens Greg didn’t feel the desire to drink anymore. “Now I had people that legitimately cared about me close by and people I did not want to disappoint. I felt included and a part of something, and that was too valuable to me to screw up.” With the support of his tribe his confidence grew and Greg started making changes to secure his future. Greg is now working to finish his PhD and go on to medical school to become a physician. Although it is something he has always wanted he was too unsure to fully commit himself. Physically he has gone from 175 pounds to his ideal body weight of 154 pounds. As he said, “I didn’t even intend to lose the weight but it just happened.” He can now also confidently defend himself on the ground. Something he says is an invaluable skill. Be a scientist. Implement what works and discard what doesn’t. So often we’re trapped in a cycle of repeating bad behaviors whether it be in combat or in life. Connection is key. Whether it be in jiu jitsu or in relationships, making a connection makes all the difference. Failure is healthy. Failure shows us our weaknesses and shortcomings. Failure is okay, but repeating the same mistake is unacceptable. If you don’t fail, you don’t learn. You either win or you learn.